When Gillian Coyne ’19 of New York City started as a language interpreter at meetings between French-speaking asylum seekers and their potential lawyers, she learned to be prepared for anything. She is one of a group of Bates French and francophone studies students who volunteer to provide a key service to the Immigrant Legal Advocacy Project, which gives free and low-cost legal services to new Mainers. Many of ILAP’s clients need language interpreters during those meetings, which are often the start of a lengthy process to gain asylum in the United States. 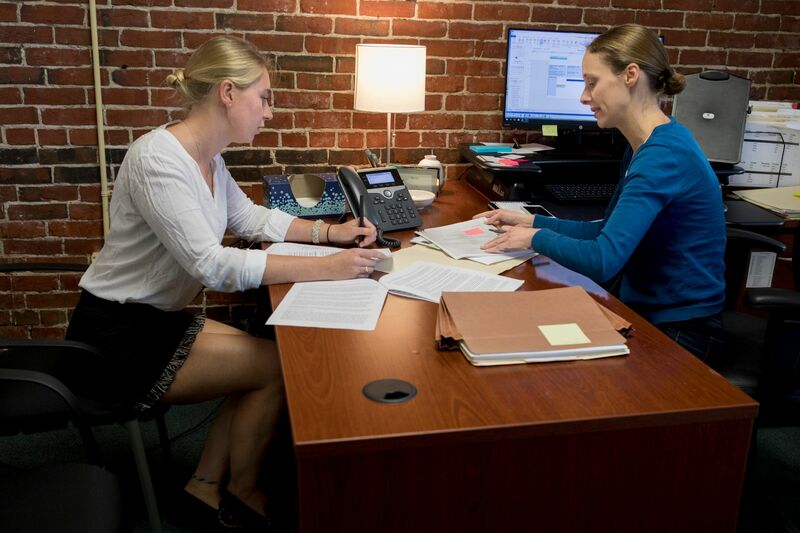 “Language is fundamental to everything that we do here, in terms of being able to communicate with clients and create a welcoming space,” says Alice Kopij, an ILAP staff attorney who runs the Lewiston office of the Portland-based organization. ILAP staff attorney Alice Kopij poses with Gillian Coyne ’19 at the Immigrant Legal Advocacy Project office. While Bates students have interned or volunteered with ILAP for years, the partnership with French students began in 2015, when Associate Professor of French and Francophone Studies Alexandre Dauge-Roth taught a course called “Borders and Disorders in French and Francophone Literature and Film,” which explored migration and identity in the French-speaking world. For the course’s Purposeful Work infusion component — in which professors are encouraged to make connections between the course material and the real world — Dauge-Roth invited ILAP executive director Susan Roche to tell the class about the organization’s work. The students learned that people often come to ILAP for help seeking asylum, a status under which an applicant can stay in the U.S. if they fear persecution in their home country. In Lewiston, many asylum seekers come from francophone countries like Djibouti, the Democratic Republic of the Congo, Rwanda, and Burundi. Some speak very little English; others can understand and speak English but need interpreters to help them grasp complex legal concepts and ensure that their own stories are clear. Dauge-Roth quickly realized that he had students who could step in. Whether they grew up speaking French, took French courses at Bates, or studied in French-speaking countries, they had the requisite language skills. And francophone studies covers a lot more than the French language. With the French colonial legacy encompassing places in North and West Africa, the Caribbean and North America, francophone cultural production “is a lot about multiple identities, migration, displacement, various forms of racial, economic, and gender inequalities and discrimination,” Dauge-Roth says. Gillian Coyne, who started interpreting during her sophomore year, says she quickly picked up the relevant legal terminology in French and English, but she also came to understand her own power as an interpreter. “As an interpreter, you are being trusted with someone’s story,” she says. “You’re being trusted with someone’s words in a way that is incredibly intimate and profound and leaves the person who is telling you their story in a vulnerable position. Gradually, Coyne and some of her classmates began to do more than interpret. During her junior year, Coyne interned with Berman and Simmons, a Maine law firm that works closely with ILAP. Asylum seekers have to prove that they fear persecution in their home country due to a protected status like religion or political opinion, and that the government of that country can’t protect them — criteria that require a lot of documentation. Once ILAP has evaluated an asylum seeker’s case, a staff attorney may represent them through the legal process, or they might be referred to a network of pro bono attorneys, including several at Berman and Simmons. Coyne and her fellow interns would research the conditions in asylum seekers’ home countries and look for French-language social media posts and news reports that could back up an individual’s claim. In the meantime, ILAP’s presence in Lewiston has grown. In April, the organization opened a full-time office, with Kopij at the helm, expanding the range of legal services and outreach it can provide. Through the Purposeful Work internship program, Coyne is working as an intern at the new office. She schedules Bates interpreters, provides interpretation at community workshops, and does country research and some paralegal tasks. Coyne says her internships at Berman and Simmons and ILAP have sparked an interest in law school and strengthened her resolve to work with migrants in the francophone world. “It’s given me so much more direction on the work environment that I want to find myself in, the type of people that I want to work with in a professional environment, and the people that I want to work with on a more global scale,” she says.